The sand glows an iridescent blue-green color as I walk along the tide line and ignite the dinoflagellates, tiny organisms that emit a neon-like radiance under the darkening sky. The moon is full and reflects off the misty, salty air that conceals the beach ahead. Besides the sound of the crashing waves, it is silent and tranquil. Just when we think we are the alone on the twenty mile stretch of beach, a giant Loggerhead sea turtle emerges from the Atlantic Ocean. We watch the turtle quietly as she begins the long and arduous journey up the beach to the sandy dunes, well above the high tide line. She drags herself using her flippers, creating tractor-like tracks in the sand. The turtle reaches her preferred nesting sight and begins to dig a large hole, using her rear flippers. After resting briefly, she fills the hole with approximately 100 ping-pong sized eggs. She then covers the hole and makes her way back to the sea never to see her eggs or hatchlings again. After we witness the incredible nesting process we continue on our moonlit turtle walk and spot seven more female turtles that come ashore to lay their eggs. Besides the long stretches of beautiful, quiet, undisturbed sandy beaches with little or no artificial light, sea turtles make Melbourne Beach very special and very unique. Located on Florida’s central Atlantic coast, Melbourne Beach is the most significant sea turtle nesting ground in the western hemisphere. Part of the Archie Carr National Wildlife Refuge, a 20.5 mile stretch of coast devoted to sea turtle preservation, Melbourne Beach is where 90% of Loggerhead turtles nest in the U.S. In fact, more Loggerhead turtles nest here than anywhere else on Earth. Between the months of May and October this stretch of coast is literally a sea turtle superhighway. Though they seem plentiful on our turtle walk, in just the past 100 years six of the seven existing species have become federally listed as threatened or endangered under the U.S. Endangered Species Act. Among the largest living reptiles (up to 7 feet in length and weighing up to 1,300 pounds), sea turtles are long-lived but very fragile and susceptible to extinction. Without stating the obvious Gulf oil spill, sea turtles are diminishing largely because of black-market trade of turtle eggs and meat, becoming bycatch due to net fishing at sea, and beach development. The lack of development on Melbourne Beach and along the Archie Carr National Wildlife Refuge is a major key in sea turtle survival and preservation. Adult female sea turtles will not nest if disturbed once they come ashore. About 45% of the time a female turtle will return to the sea without laying her eggs, largely due to human interruption. Furthermore, beach development hinders the survival of turtle hatchlings that make their way to the sea by the light of the moon. Many times on developed beaches, the hatchlings mistake the lights of cafés, bars, hotels, and houses to be the right direction to the sea. They become disoriented and perish in the coming day’s heat of the sun. In fact, only 1 in 1,000 hatchlings survive to maturity, making sea turtles even more precious and vulnerable. By visiting Melbourne Beach you can observe the age-old nesting practice of these magnificent and prehistoric creatures. Be sure to be very quiet, respectful, and never approach a sea turtle that is making her way to a nesting sight- she will return to the sea without laying her eggs. Observe from a distance and feel the significance of what you are witnessing. Feel a strong connection to the universe as the moon pulls the tide; turtles emerge from the water to reproduce as they have for eons, hear the waves and feel the balmy breeze that has been the backdrop to this process for nearly as long as the Earth has turned. We finish our turtle expedition and return to the lovely beach villa where we are staying. I rinse the salty sand off of my feet and climb into bed. My head hits the pillow and I fall asleep to thoughts of gracefully swimming turtles that come from all corners of the world to visit Melbourne Beach. In folklore, turtles are sage, all-knowing creatures and our mutual choice to visit Melbourne Beach makes me feel like I've followed their good advice. We awake to the early morning sun shining through the window. We grab our coffee and beach bag and venture back out to the quiet and unoccupied beach for some watersports. We don’t expect to see any turtles of course because they only emerge from the water to nest at night when it is dark and quiet. Nevertheless, we see a tiny turtle hatchling, above the tide line, stuck on its back, struggling to flip over. We watch the baby turtle for a moment and discover he has no hope of flipping on his own as the heat of the sun weakens him. We pick him up and place him into the sea. The tiny hatchling swims away, onward to his life journey that may last over one hundred years. I often think of that little turtle and where he may be in the world. Gracefully swimming, migrating across oceans every year. 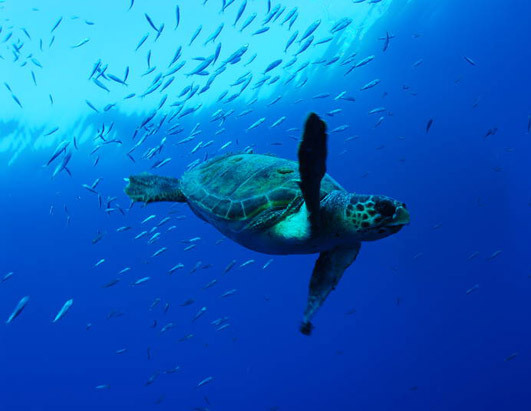 Sea turtles are travellers, wise and worldly with the capacity to traverse the globe. Perhaps this is my fascination with them. These ancient beings have existed for millions of years and with help of efforts like the Archie Carr National Wildlife Refuge, hopefully they’ll be around for millions more.